“You have got the power! 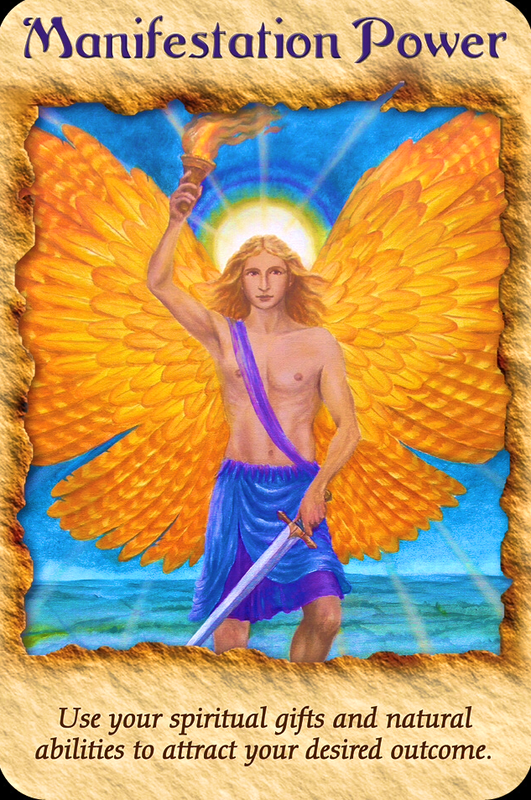 With this card, the angels remind you of your innate spiritual abilities. Perhaps you have been complaining about something or have been feeling like a victim under the influence of someone else’s will. This card is a reminder that you do have the power to change everything in your life by using your natural spiritual gifts of manifestation. When you complain, you give away your power to others. Complaints are also negative affirmations that attract more of the same undesirable effects. The angels would like you to replace the old complaining habit with a healthier response of visualizing and intending your desired outcome. It works! When I really, really…. REALLY want something to manifest, my favourite tools are crystal grids, mini vision boards, and letters to the angels. These are powerful tools and must be used always only with the intention for the highest good of all involved. When you make a crystal grid, you first clear the crystals of any and all previous energies, then charge them with your intention. Both of these steps can be done by blowing “through” and then into the crystal while holding it in your hand. Next you place a photo, drawn picture or written words as the base of the grid, whatever is meaningful to you, there is no “right or wrong” here, only intention. Place your crystals mindfully around the grid, either all pointing in towards the intended outcome to give it the energy to manifest, or all facing out, which will take the energy from the intention and manifest it. You will know what feels right, trust your intuition! Every day, morning and evening (more if you have time!) blow your intention back over the grid, saying silently or out loud what you wish to manifest. Thank your angels and guides, the Archangels and the Ascended Masters, the Universe and the crystals themselves for helping you to manifest. Leave the grid set up until the next full moon. When the full moon comes, recharge all of the crystals and if necessary, rebuild the grid or use it for your next intention! (ANY crystals can be used in this grid, and they do not need to be expensive, but simple small quartz points are ideal). Vision boards are amazing tools, but mini vision boards are perfect for short term manifestation goals! Usually vision boards are used for broader lifestyle goals, this is for specific, focused manifestations although they can be big or small).You can buy 5×7 and 8×10 canvases at most dollar stores, and these make a great base for these special creations. Draw, cut out or print out simple words and pictures which create a collage based around a very specific manifestation. Place a quartz crystal in the center, attaching it with hot glue, which will not damage the crystal chemically. Breathe your intention into the vision board morning and evening, and gaze at it for a minimum of 1 minute 2x a day, morning and evening. Place the vision board where you can see it every day, but if there is ANYONE who will not support you in this, then I strongly suggest that you keep it under your pillow and take it out morning and evening to gaze at. When you are done gazing, and have set your intention, always finish with gratitude. Lastly, a wonderful tool to use is a simple letter to your angels, guides, The Archangels, an Ascended Master, or the Universe. Whoever you pray to is who you will address the letter to. This is a thank you letter. It is full of gratitude for the wonderful solution that has been provided to your situation, the manifestation that has come to pass, the abundance and prosperity that you have been blessed with. Whatever it is you wish to manifest, write the letter of gratitude as if it is so, in a state of heartfelt joy. Place the letter and a quartz point or your favourite crystal on top of it, breathing your intention into the crystal. Place both by your bedside or under your pillow. If you have trouble writing the letter with enough positive high vibration (the doubt is kicking in) then either re-write it until you feel it is the best you can do, or re-read it at least 2x a day with feeling. You will know what will work best for you. The angels are waiting to help you, the crystals are your ally’s and the Universe will provide. I also want to be a power angel girl.